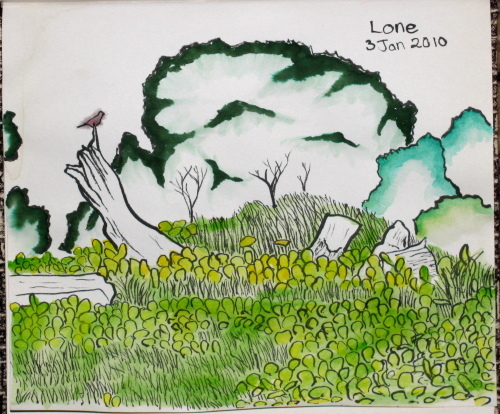 Quite a few sketches done of the wilds this month. Although this bit of wild was actually after the fact, from a recent Wilcox Property photo. Some oaks that looked like parts weren't that healthy hiking in a state park. A small waterfall in the state park. A more elaborate fall just below the previous. Another from the same recent photo set of the Wilcox Property, so not really wild. Up a little tributary in Monrovia Canyon. Ripply little waterfall in Fish Canyon. The bottom of the big falls in Fish Canyon. A willow in a crack by the waterfall edge in Rubio. One of the tall falls in Rubio. The snow is all quite melted again and the water level not quite still at storm surge level, but I decided to go out and see Rubio's falls once more. At least a few of them. Sometime, I would like to go up to the valley high above for the day, but this wasn't the day. I would also like to see where the well trod path that goes up past the water storage and into the bit of canyon area between Rubio and Eaton goes, but this wasn't the day for that either. This was a day to hike up to the first falls and then decide what else to hike to. That ended up being both to the top of the first falls and the little falls behind it and then up to the lookout for the biggest waterfall. The trail continued to look about to be washed away in places and yet somehow no worse than before the rains. The falls by the pavilion I've never seen are still buried. The falls we do see are still short. Everything was as it was left, except there's quite a bit more water whooshing over the edge. I climbed up to the space between the tiers for the full, surrounded by waterfall, effect. Looking over the edge of the falls as the water leaps out into space. I went up Fish Canyon again today. The quarry guys were telling us to finish by 2 or 2:20 today instead of 3 like usual. I was sort of counting on that usual time out to have enough time to dally here and there. I went up the trail fast enough to feel the up even though it is a very mild trail. (Then again, I am rather out of shape these days.) I came upon a tributary I was suspicious was the one I'd heard the waterfall up before. I listened closely, but couldn't hear it today because everything else below it was so loud. I followed the faint trail up it anyway and found the delightful little waterfall. It turns out that if you go even closer to it than I had before when I was in a hurry to get down, it's even more delightful. The water comes down into a bit of rock that looks like a square has been cut from it. 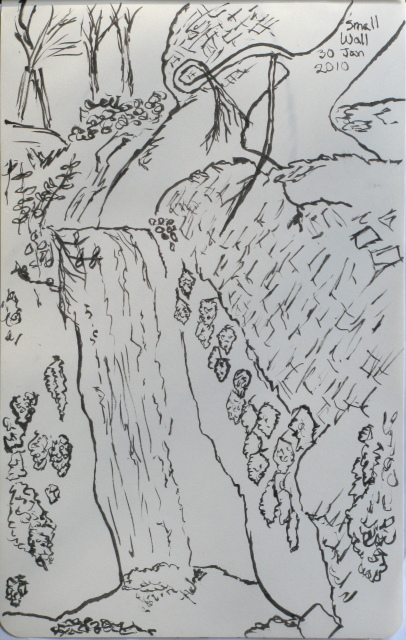 My sketch of the waterfall along the way to the big falls. This one comes down one very flat side and has another flat side square to the falls to make a little box. I came down again and found that the stream crossing was very shortly after my stop. There, some city trail workers were putting in some stones to cross the water that was a little wider than before. A plank from the previous "bridge" was a short distance down the stream. The falls are not very far after the crossing. I've already drawn part of them, but I did decide to do a sketch there too. 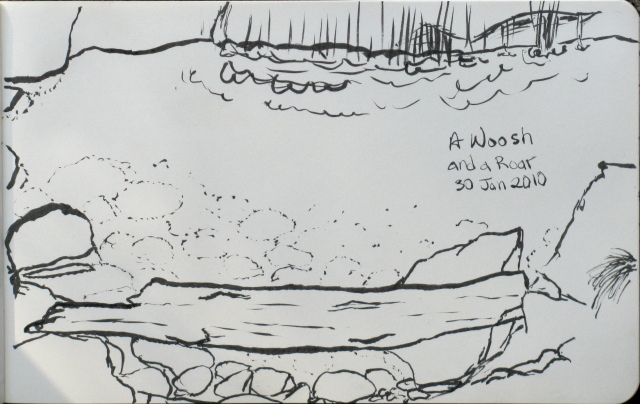 This was of a log wedged into rocks and placed perfectly to sit upon and watch the water pour over the rocks and surge out from the landing although no one was taking advantage of it. The pool below the main falls coming into Fish canyon. The water pours in with great speed and then washes out in surging waves. A log on this side of the pool serves as a great seat to witness the raw power of the water. After I finished, I had about half an hour to get back down. I didn't quite make it by 2, but certainly by 2:20. I saw one more bit that might have made a fun sketch had I had another half hour, and they didn't seem as rushed as they implied they would be when I got down, so now I don't know if I should have believed them. I did stop to look at a concrete thing apparently meant to help measure the water flow which also happened to be where the fishermen of the day had got to. They were at least seeing fish they wanted to go after. The guys from the quarry said that last week there was a Fish and Game guy up there taking genetic samples from the various fish, which are quite small but numerous. We had a fair bit of rain, so I decided to go out and see the waterfalls, or at least one. I wanted to go to Fish Canyon, but the shuttle was canceled "due to rain" even though it was supposed to be sunny. I was going to go anyway, hiking over the edge of the canyon down into it, then I got lazy and just went out to Monrovia instead. I still needed to get exercise, so parked on the street and walked in. The snow level came down very low over the many days of rain and there was a little snow that could be seen still up on the hills on the way in. The hills around Monrovia Canyon aren't all that high, but a little snow remained in among the vegetation. The park has quite a variety of trees that really shouldn't be growing here. Pines, yes, but the furs and ceders and palm are a little odd. 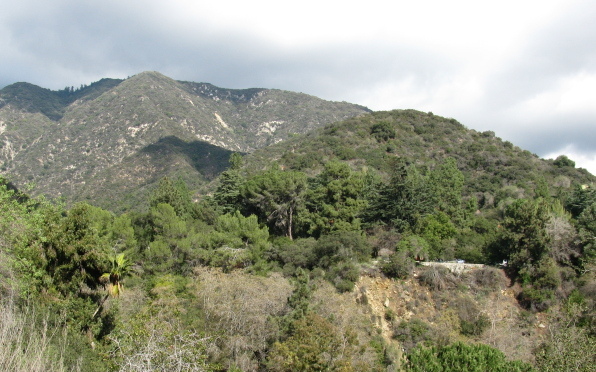 Placerita Canyon State Park is on the edge of the Angeles National Forest in Newhall. Getting there just involves getting off the 14 just after the 5/14 split on Placerita Canyon Road and turning off a few miles down at the park entrance. There is also parking near Walker Ranch for a much shorter walk up to the waterfalls. It's good it's so easy to find since I managed to take off without directions, camera, or house key. I went to go hiking to the falls. This is a rather tame trail gradually gaining some minor elevation over 2.5 miles. It turns out the park actually has a few other trails wandering about the place. Before going up to the falls, I turned up a trail that claimed to be to a peak in less than a mile. Manzanita mountain isn't much of a peak and has a great big fire break going up the ridges next to it that many people have trekked up. It quickly leaves the "mountain" behind. I climbed up to a somewhat better peak and realized that the trail, such as it was, would just keep on going and eventually take me up to the road far above the park and likely further. Rather than do that, I headed back. 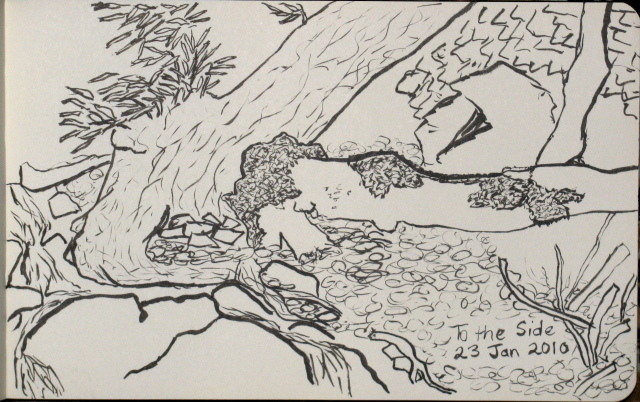 On the way back, I stopped down in the side of a steep, tiny canyon the trail was going up and sketched the oaks there. Steep and tiny seems to be the general theme of the side canyons in the park. 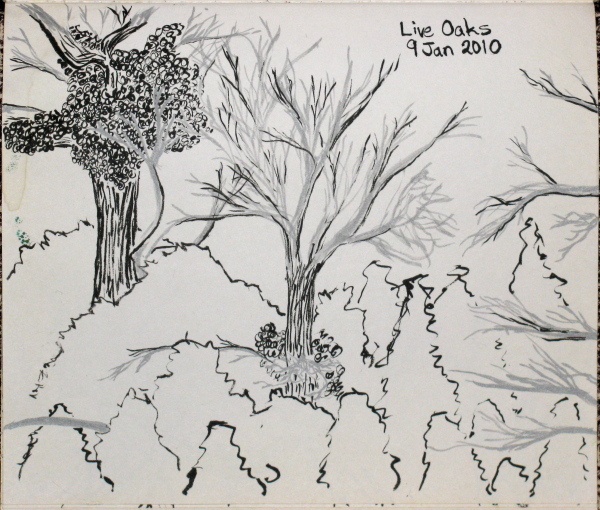 These oaks don't look like they're doing very well. Years ago there was a fire and most of them were killed, at least at the top. The trees still stand along the valley with some growth around the bottom and generally light branches due to losing the bark above. Oaks growing in the dense brush along the steep side of a small canyon. Some fire long ago seems to have killed off the tops which have now lost most their bark, but below there is still bark and living leaves about the tree until the bark ends. Once back to the canyon trail, I followed it up. It is wide and easy and had many many people coming down it. Some of them were quite heavy and in need of a bit of walking like that. The first trail also had quite a few people, but this trail had a fairly constant flow. It passes a tiny spring with gas bubbling out of it and a number next to it so likely you can find out what it is with an audio tour. 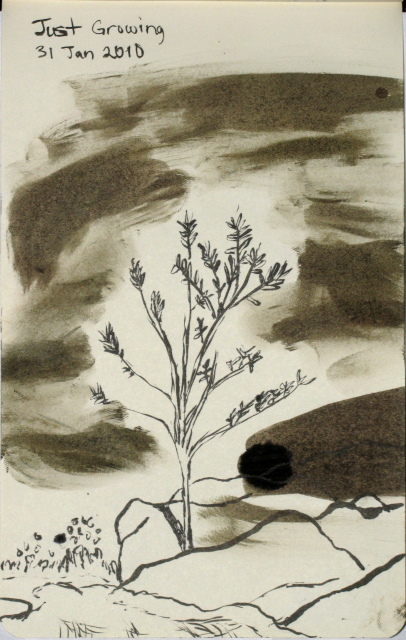 The spring looks quite dirty. The trail keeps meandering about two miles until Walker Ranch. The falls trail then turns up into another tiny canyon. It is no longer so easy going. Around one corner there was a strong sulfur odor and white deposits on rocks and even leaves in the stream. The stream itself kept coming and going all along the way up. There would probably be a little water, but not much. It was better than the promise held by the stream at the Nature Center where it was quite dry. Then there's suddenly a little waterfall. A trail going up the left showed a route up to the top of it and the rocks themselves look highly climbable on the right, maybe even easier than the trail. Once up there, there's another little waterfall which also has a trail to the top on the right. Above that is a giant log and the trail doesn't seem to get any smaller so maybe there's more. People didn't go much further when I was there, though. 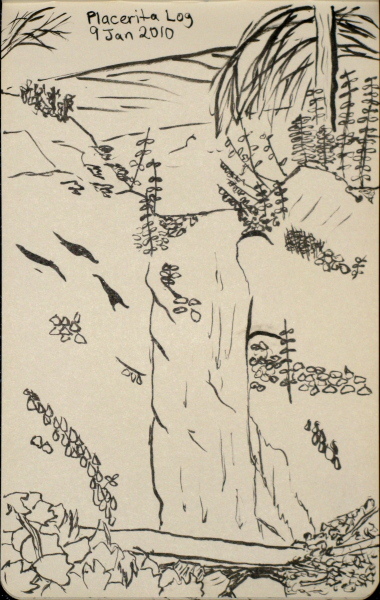 I decided to turn back and draw first the top waterfall. The second waterfall along the trail. This one is very straight and conventional. While I was there, a family came up the falls trails with the destination of the giant log above the second fall. Mom, dad, and three kids the youngest looked about 4 and had a bit of help from dad getting up, all walked up and down the log. The boy must have been told they were going to find a big stick because he kept pointing at things saying, "Is that a stick?" He and his sisters seemed to have quite a good time once they found the stick they were looking for. 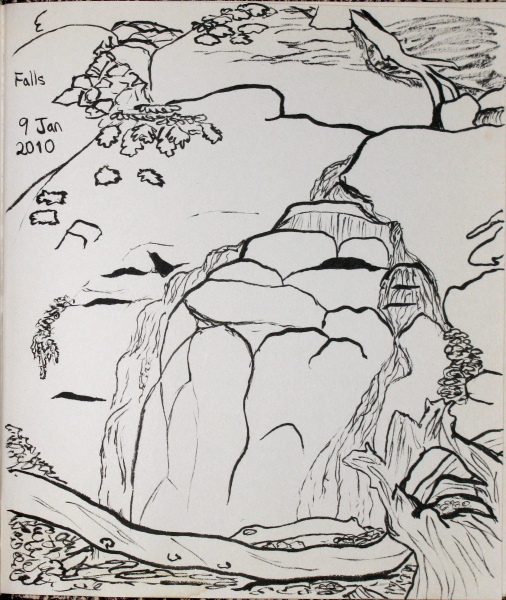 Once my muscles were a bit cooled, I made my way back down to draw the first waterfall. Looking from the top, the straight up route still looks easier than the last bit of across of the otherwise easy trail but because it's not supposed to be I went by trail. Which was even scarier on the way down. 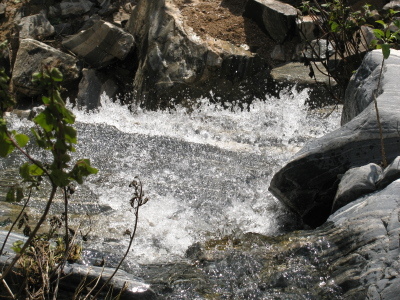 The first waterfall along the trail is more of a cascade with this amount of water. It has a lot more spots to make the water splash and give the whole thing texture. A fellow by with his three grandkids who had himself been coming up this for some 40 years, rather liked this one. Me too. 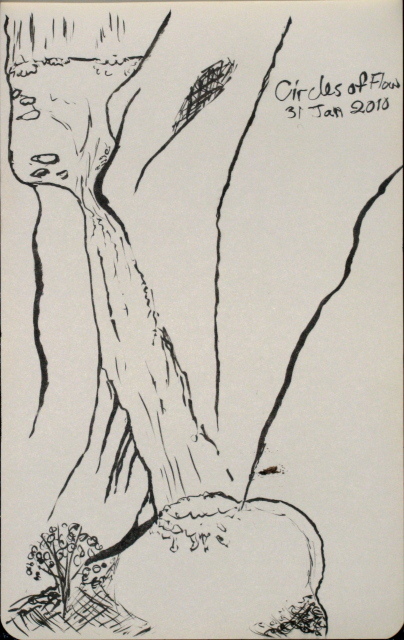 The top waterfall is a sheet of water coming over a flat, straight rock and this one is a dribble of water cascading more than falling over two routes, the left one the main one, to find the pool at the bottom. I then turned back to head toward the car. It started to get suspiciously dark with more than a mile to walk still, which was my first indication it was getting late since I had forgotten my watch too. Sunset was coming on and would be ever faster with all the sky increasingly overcast. 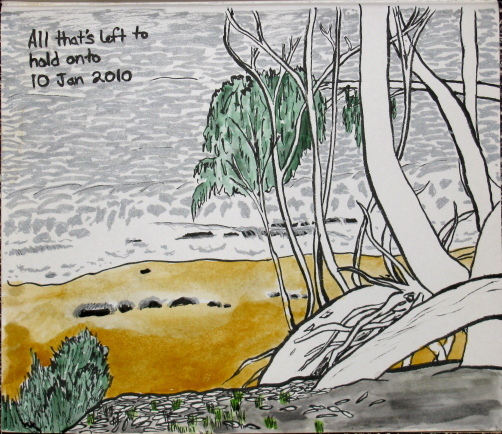 It was cold up by the waterfalls and I put on my fleece before settling in to draw. I kept it on to move to the lower one and zipped it up before starting the second drawing. It didn't come off, or even fully unzipped, all the way down. Kindly, they hadn't closed the sunset to sunrise gate by the time I got there, still with quite a bit of light. There were actually still a lot of people using the park even if they were all wrapping it up. This is a very popular park.